And don’t you wish you had reservations. I do! 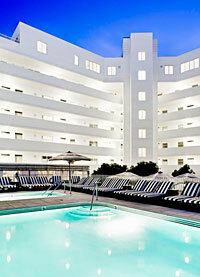 Check this out – Santa Monica’s architectural gem, Hotel Shangri-La, has officially opened its pool and lounge. The latest addition to the 70 year-old historic landmark which has just undergone a $30 million renovation, the pool and lounge are the definition of Southern California living. FYI, your bikini better be worth some cold hard cash…..
Set against the Pacific Ocean, this lush green sanctuary features al fresco dining, an outdoor bar, spacious cabanas, lounge area, with pool and Jacuzzi. Guests are given the opportunity to take a dip in the pool, sip cocktails around the fire pits, or enjoy an intimate meal in one of the draped private cabanas. This unique outdoor experience is the brainchild of hotelier Tehmina Adaya and designer Marc Smith. The pool and lounge are supported by a multi-tiered deck with citrus trees creating enclaves that provide guests with an unparalleled level of intimacy. Guests are invited into plush chaises and chairs made of reclaimed black teak and upholstered in a classic black and white stripe. I just want to know what the pool boys are wearing! The lounge and pool feature the complete menu from The Dining Room at Hotel Shangri-La; a menu that features the finest in French influenced farm fresh cuisine. The drink list, which showcases two signature drinks, The Shangri-La and The Shangri-La High Tea, are created from fresh squeezed juices. But since champagne is my favorite drink, you can find me poolside with a fine French – oh and a bottle of sparkly. Hotel Shangri-La has created several special offers in conjunction with this exciting opening. Guests who reserve a cabana for $1000.00 including bottle service and pool-side concierge will receive a one-night stay in one of the hotel’s “Cozy” guest rooms. 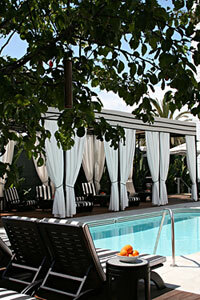 In addition, hotel guests can reserve cabanas for $125-250 per day. Oh, if you book this package, call me. I’ll be on my first flight down from SF. But first, you have to call or visit their website and make a reservation. Good luck!